We are just coming back from the WordCamp Nagpur. It was really a wonderful experience visiting the Orange City of India – Nagpur. Team KrishaWeb has visited the WordCamp along with the other Ahmedabad WordPress community members. 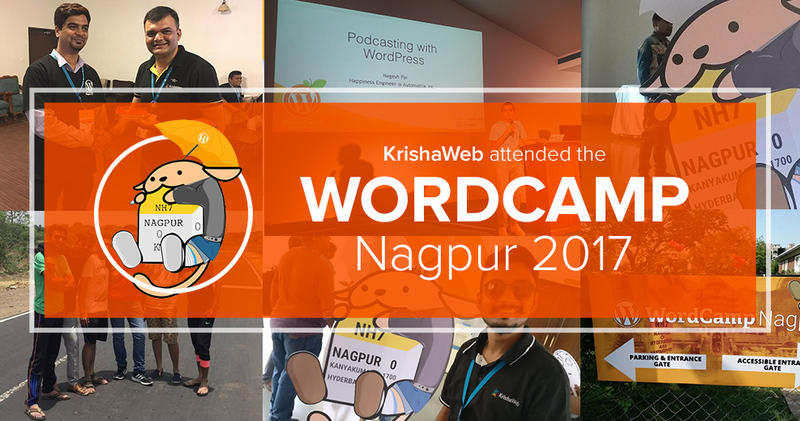 Here I am sharing our experience and some unforgettable memories during the WordCamp Nagpur. Keep reading and join me in the exciting journey to the Orange City. KrishaWeb has been participating in the WordPress community quite consistently. WordCamp Nagpur was the third WordCamp that we have visited. It was really a memorable experience being the part of #WCNagpur and interacting with the amazing WordPress community. WordCamps are not always about the technical discussion. We have learned many things from the marketing and management perspective as well. The scheduled dates for WordCamp Nagpur was 24th – 25th June 2017. And the amazing place they have selected was the Chitnavis Center, Nagpur. Nagpur is approximately 866 KM away from the Ahmedabad. So, the journey was long and it becomes even excited when we choose to reach the destination by road. Along with our few other WP Ahmedabad community members (Harsh, Nimesh, Chetan, and Pravin), we have started the long road trip early in the morning on 23rd June (Friday). We started the drive at sharp 6:30 AM. We choose the road that takes us through the famous Omkareshwar Jyotirlinga in the Madhya Pradesh. We reached the temple in the evening and continued our journey to Nagpur from there. After almost 22 hours of traveling, we reached the city Nagpur early in the morning around 4:30 AM on 24th June. It was really a memorable road trip with the WordPress Ahmedabad. It was a big day on the way so, we choose to take some rest and get ourselves ready for the WordCamp Nagpur. Chitnavis Center was the place selected for the two-day event of WordCamp Nagpur. The center is in the center of the city having multiple auditoriums and open networking space. There were three tracks going on simultaneously on the first day of WordCamp Nagpur. One was for beginners, second was for developers and the third track was dedicated to all community talks. They have also organized a Plugin Pratiyogita in the evening. Developers came up with the various plugins presentations that can help your day to day WordPress development. WordCamp Nagpur has also organized a nice party for all sponsors, speakers, and volunteers in the evening. It was really a wonderful day where we had some wonderful sessions from the experts and got the chance to talk with the industry experts about the different challenges we face. Day-2 at the WordCamp Nagpur also had the two tracks. One track was for business targeting the normal WordPress users and the other one was for all Designers and Developers. All the tracks during this two-day event were very informative and useful. The best part was that there were lots of learning and information even for the non-developers. Following are some of the awesome sessions from the WC Nagpur that one should not miss. How cool is WordPress in School Syllabus? It is always wonderful being with the WordPress community. Spending two days with at the WordCamp Nagpur was the same experience. We had a fun time taking selfies at the event and throughout the journey. We took tons of selfies and uploaded them on the social media. If you missed any moment of the WordCamp Nagpur, just go to twitter.com and type #WCNagpur and you will find everything you need to know about the event. We are very thankful to the whole WordCamp Nagpur team to provide us an opportunity to meet and interact with the awesome WordPress community. We are definitely looking forward to the next WordCamp. Are you?